Ghee has science on its side as well. Since most digestive enzymes are fat-soluble, and their precursor is fat, it is perfect for stimulating those enzymes, allowing food to be broken down more efficiently. That’s why Ayurvedic practitioners often use ghee as a base in their herbal formulations. For example, the preparation pancha pikta ghrita combines five bitter herbs with ghee in order to quickly and evenly deliver herbal healing deep into the body’s lipid-based cell walls. Ghee can help protect those cells as well. Two of its ingredients—vitamin E and beta-carotene—are known antioxidants; so it can be categorized as a free-radical fighter. Ghee is not something you want to over-consume though, especially if you have weight or cholesterol issues. Ayurvedic physicians recommend consuming ghee in very small quantities, such as one to two teaspoons per day with meals. Although ghee is simply butter with the sugar and protein solids removed, it is not often recommended for cooking because it is considered too heavy and heat can alter its chemical structure. Instead, try stirring a teaspoon into freshly cooked rice, spreading a bit on toast, or using it to top a baked potato. Ghee can be found in most health food stores and specialty markets, but it is easy to make at home and keeps well. Melt one pound of organic, unsalted butter in a saucepan over medium heat. When the butter comes to a boil, reduce the heat and simmer uncovered and unstirred for 45 to 60 minutes. Once the water is gone and the milk solids have settled to the bottom, ghee will appear as a transparent, pale golden liquid on top. Immediately strain it into a clean jar. 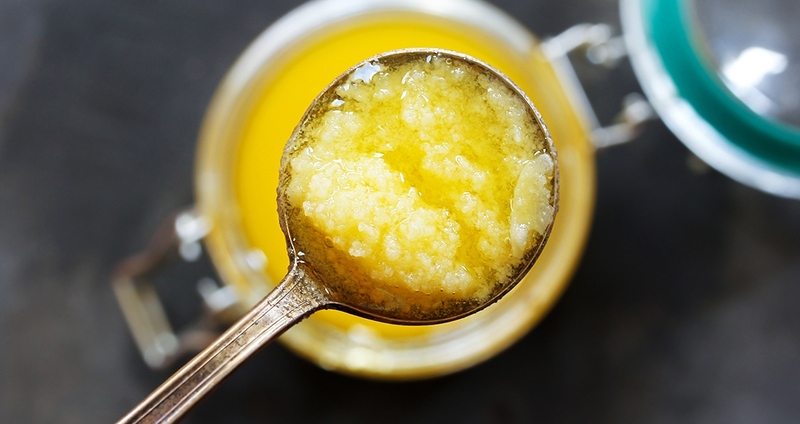 Ghee stays fresh for weeks (some say up to a year) at room temperature.